As part of the 2018 Bury in Bloom campaign, Hawksmoor’s Bury St Edmunds office is sponsoring two projects based around the theme of Poppies, to commemorate 100 years since the end of World War I. The projects have been organised by Bury in Bloom co-ordinator Melanie Lesser, and Michelle Freeman from The Crafty Foxes – who run craft workshops and parties for adults and children around Suffolk. The ‘Field of Poppies’ project involves designing and making 150 poppies from recycled materials to simulate a World War 1 field of poppies in the Bury St Edmunds Abbey Gardens. They are being made by local schools, colleges and organisations across the area, including a scout group and the Gatehouse Dementia Hub. Each location will produce around 15-20 poppies with the creator’s name attached to it. These are then planted in sections, and each section is added together to produce an entire bed of poppies all made from different materials. The ‘Create a Craft Poppy Competition’ is open to anyone of any age, as an individual or with classmates, work colleagues or family. Entrants are encouraged to produce a poppy-themed creation in a medium of their choice on the subject of the Remembrance Poppy, inspired by the poem In Flanders Fields by John McCrae. The competition closes on 4th September, and all entries will be displayed in the Apex arts venue in Bury St Edmunds. 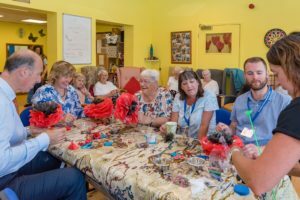 Senior Investment Manager Max Weatherby, who is also head of the Hawksmoor Bury St Edmunds office, visited the Gatehouse Dementia Hub to help hub staff and clients create some vibrant poppies for the display, from recycled materials. For more information, visit the websites of Bury in Bloom and The Crafty Foxes.